George Wyndham became the father of Aussie Shiraz after planting Australia’s first commercial Shiraz vineyard in a place called Branxton in the Hunter region of NSW in 1830. 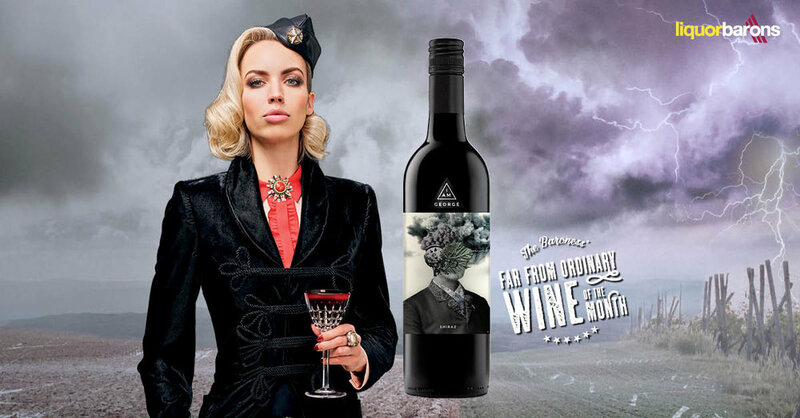 I am George is an Australian label dedicated to this wine pioneer. An aristocrat gone rogue, Wyndham was sitting at home in his Wiltshire estate feeling unsatisfied with his ordinary lifestyle, childhood of privilege and first class British education. He wished to explore the world in the search for something greater. He decided to carve his own path in his quest for the unexpected, embarking on an ocean voyage to the other side of the planet, through ferocious oceans, wild storms and months of uncertainty. After a lifetime at sea, George Wyndham arrived finally here on dry land in the young British colony of New South Wales. In a land stricken by drought, bushfires, murderers and thieves, George saw opportunity but the stark realities of his new life hit hard. If his crops didn’t prosper in this strange new world, his family would starve. He planted anything he could get his mitts on, including 39 different varieties of apple, praying just one would survive the harsh climate. But nothing did. George missed the creature comforts of his old life. Good food, soft bedsheets and red wine. The very notion of red wine fortified George as it became a symbol for a better life which he soon began striving for. George’s strength of will and determination forced the natural world to finally yield to him. Slowly, delicately – green shoots emerged from the soil. Fruit appeared. George successfully planted the young nation’s first commercial Shiraz vineyard but didn’t just plant grapes in those early years; he planted a legacy. Over the years, George’s wine became recognised across the world, winning a number of prizes and trophies, including bronze and silver medals in the Paris International Exhibition of 1867. At one time, the vineyard was the second largest in New South Wales, with 1830 vines still producing fruit in 1966. After over 100 years of developing excellence, the winery eventually became part of Pernod Ricard when they purchased the Wyndham Estate winery in 1990. His innovative spirit is a proud legacy that endures to this day. George Wyndham’s new wines are just like him - bold and robust with a backbone. Bold in flavour, courageous in composition, rich in dark fruits and chocolate. Unapologetically George Wyndham. Chief Winemaker Steve Meyer honours this heritage with varietal styles like this Shiraz which has been selected from the winery’s best Shiraz parcels in the Langhorne Creek region. The Shiraz is then matured in French and American oak barrels for up to 18 months. This Shiraz also picked up two Gold and five Bronze wine show medals. 2014 was a vintage worthy of celebration in Langhorne Creek. Good early rainfall and slow ripening led to great fruit flavour and colour. Hot summer weather was tempered by reliable cool Lake Alexandria breezes. I Am George Shiraz is deep purple with vibrant hues with intense red fruits and liquorice, underpinned by dried herbs. To taste, you’ll notice ripe plum, berry fruit, chocolate, mint and cedar flavours which are then enhanced by fine powdery soft tannins and well-integrated oak. Great with a variety of red meat and tomato based pasta dishes. Please enjoy I am George responsibly.